Come enjoy the perfect business climate year round at the new North Carolina’s Wilmington Convention Center which offers a casual business environment with a nautical theme which sets the scene for your groups next conference, meeting or seminar. Grand Opening Weekend January 13th-15th. Conveniently located on the riverfront in Historic Downtown Wilmington NC, and just a short drive to the charming beaches of the Cape Fear Coast, the Wilmington Convention Center is the perfect getaway to get down to business. Whether you’re a small business, a big association, a large corporation, or somewhere in between, North Carolina’s Wilmington Convention Center caters to your every business need. 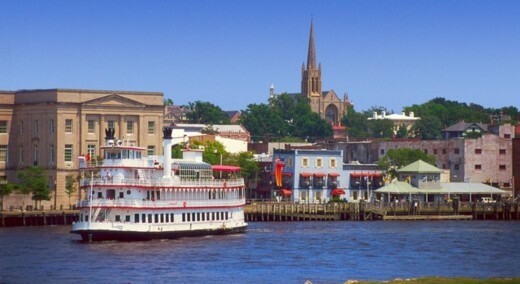 From the wireless exhibit hall to the stately southern charm of the ballroom to the Cape Fear River porch views, their services revolve around your meeting needs. Let them turn your next event into the success you’ve always dreamed. This is also a perfect venue for weddings, banquets and reunions whether intimate or grand. Wilmington’s commitment to a sustainable environment can be seen throughout the new Center. What has evolved from the drawing table is an eco-friendly building, pending LEED Certification that adds function and aesthetics to blend into Historic Downtown Wilmington such as water saving devices, aggressive recycling program and a green cleaning and maintenance program. Within close proximity are located twelve distinctive Wilmington, NC bed and breakfasts which offer a unique alternative to hotel lodging with personalized services and amenities. With respect to the cliché, “Getting there is half the fun,” we believe that being here is most of the fun. So set course for the Wilmington Convention Center and get ready for the most successful convention your group has ever had. Bon Voyage. This entry was posted in convention center by Doug Erickson. Bookmark the permalink.